Blowout Sale! Save 56% on the Hamilton Beach 49970 Personal Cup One Cup Pod Brewer by Hamilton Beach at Rat Coffee Shop. MPN: 49970. Hurry! Limited time offer. Offer valid only while supplies last. 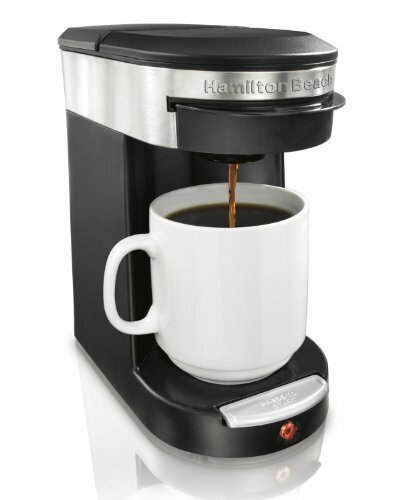 Hamilton Beach Personal Cup One Cup Pod Brewer. For fresh coffee made fast, look no further. The Personal Cup Brewer makes a single cup the easy way. Only works with loose ground coffee or disk-shaped soft pods (not compatible with K-CUP packs*, capsules or other single-serve packs). *K-CUP is a registered trademark of Keurig Green Mountain, Inc. Use of the K-CUP trademark does not imply any affiliation with or endorsement by Keurig Green Mountain, Inc.